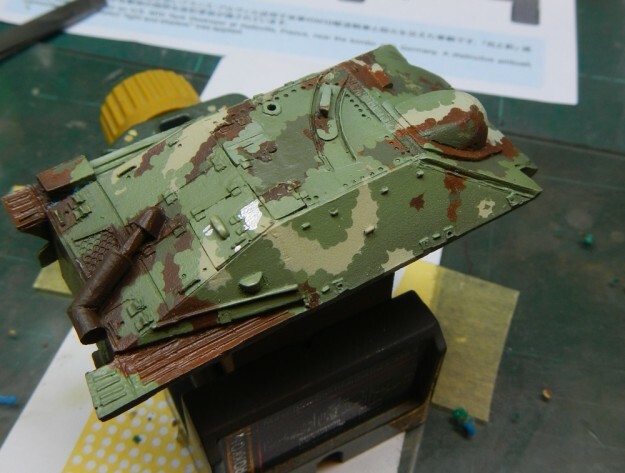 Another great collaboration, in this occasion from our friend Jose Luís Diez “Porta”, who shows us how recreate the mythic ambush camouflage used in Hetzer tanks, using the Bolt Action model in 28mm (1:56). We are going to paint our Hetzer with a camouflage pattern with disc shapes, characteristic of the final years of the war, when it was needed German tank hunters go unnoticed. 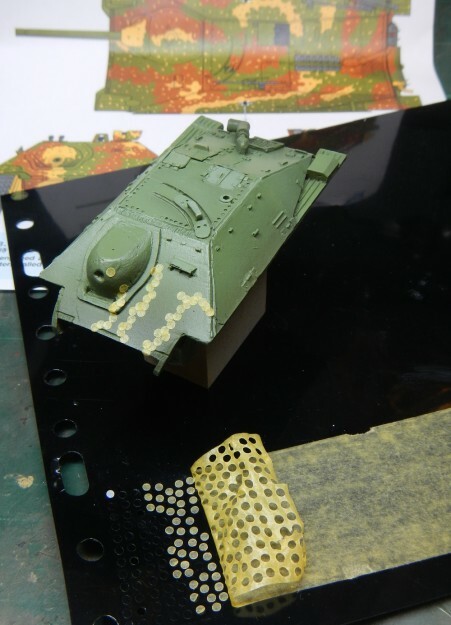 In order to recreate this kind of camouflage, we’ll need so much patience. Technically is not complicated, indeed, probably it’s more complicated painting a tritonal camouflage with fuzzy edges to hand raised. 1. I start applying the essential primer layer. In this case I´ve used grey color to get a neutral base to the three colors. 2. 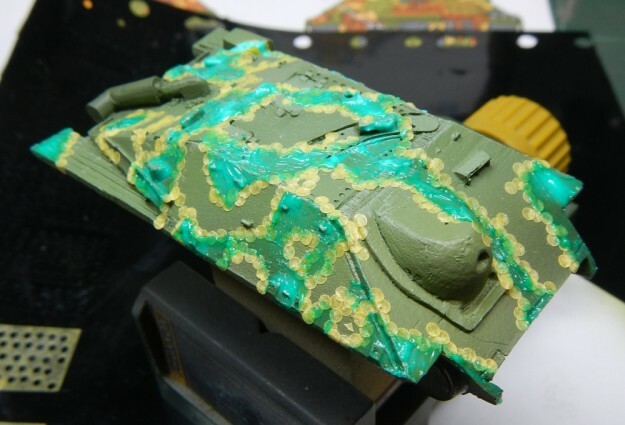 After studying with attention the documentation, and above all the camouflage pattern in different views (I’ve use the material provide in the 1:48 Hetzer kit from Tamiya), I decide apply first a general layer of green color, because the total amount of this color and because his distribution. Like base color I use Olivegrün H405 from Hobby color, diluted with isopropanol (fast dry and fine spray). 3. 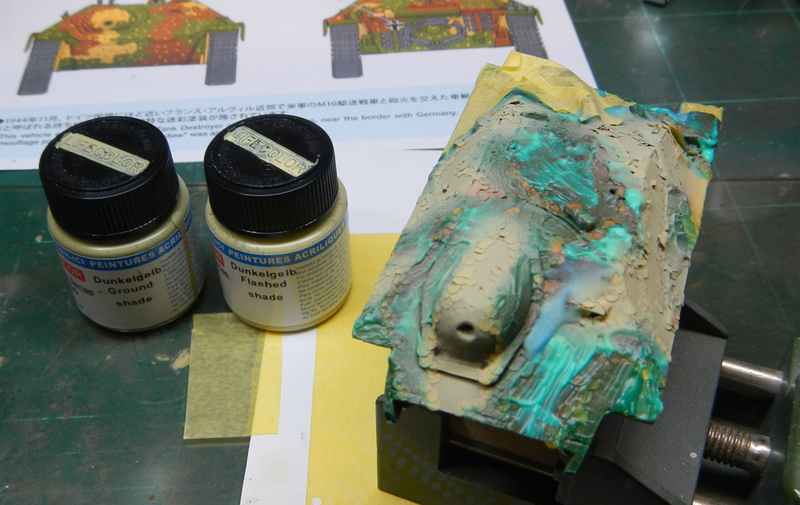 I apply lights with two green from AK-Interactive, 716 and 715, both from the German Late War Color set. I apply smooth transitions, following a zenith illumination, but without generating too contrast (in my opinión, excess contrast can muddy the final result in this kind of camouflage). 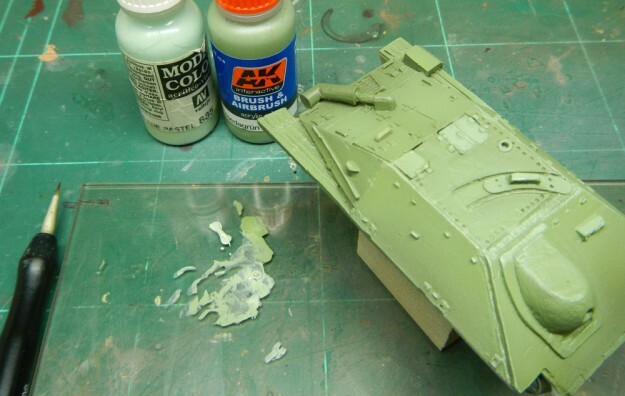 I apply the last light in rivets and hatches, using AK 715 and pastel green 885 (Vallejo). 4. Now it starts the fun….with a 2mm puncher and mask tap from Tamiya we prepare a lot of cicles (I’ve done about 250! ), on a plastic sheet. 5. I start to mask the part I want to be green, following always the camouflage pattern. To save time and circles, en the big areas we can use Maskol (liquid mask). 6. 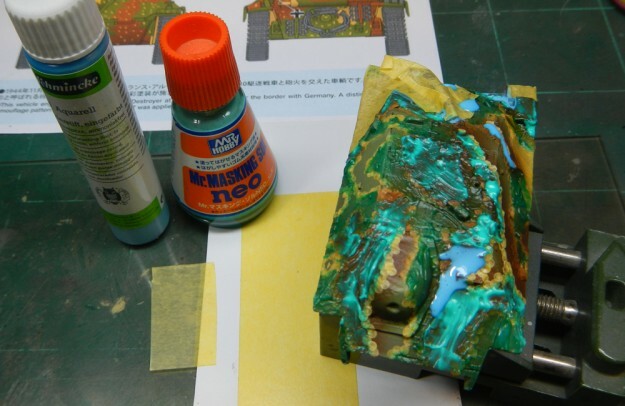 Now I paint the brown color, using AK 717 and 718 and following the same pattern of illumination used in the green color. 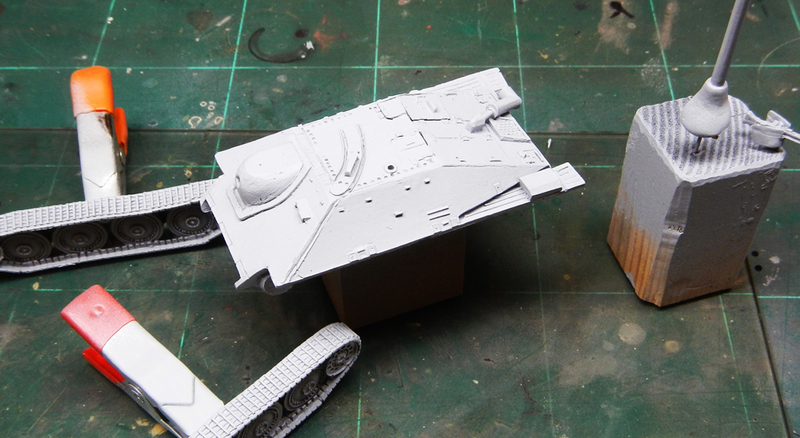 I don’t paint some zones because these will be painted in dark yellow. 7. 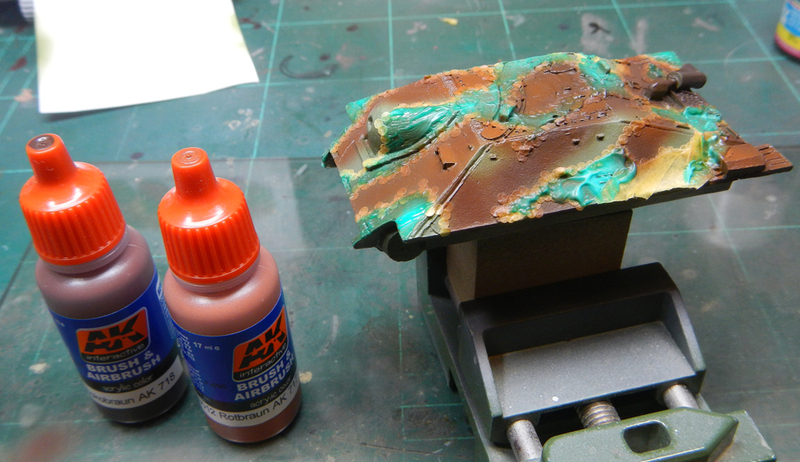 Once again, I mask those areas we want to hold in Brown using circles and liquid mask. 8. 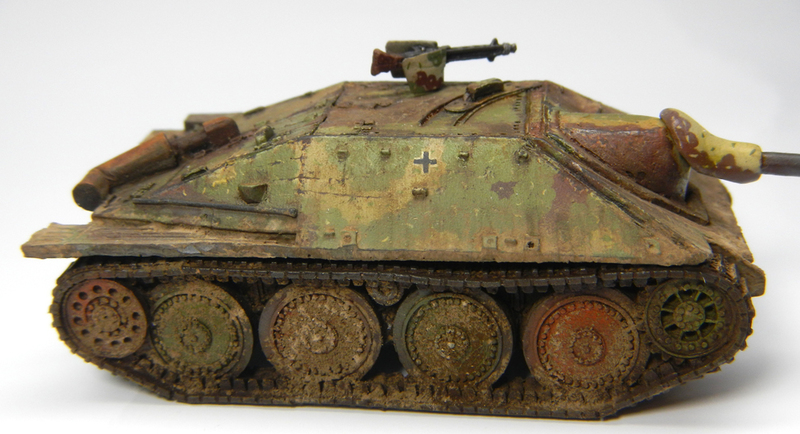 I paint the Dunkelgelb, using the LiveColor modulation set. 10. but we can solve. 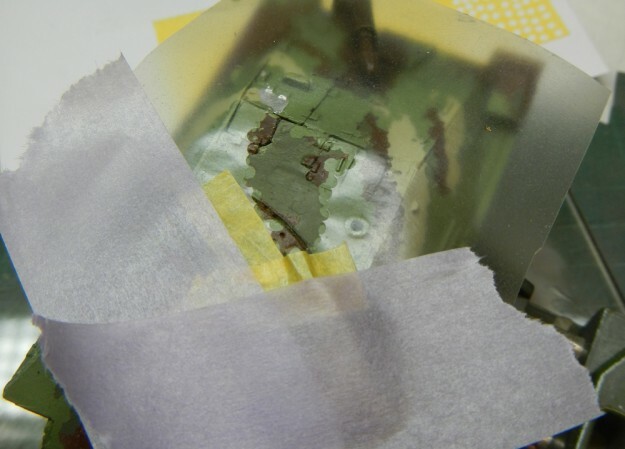 To the big brown areas I use transparent adhesive mask, which I drill using the puncher. I use a transparent one because I can put the mask exactly in the interesting site, following my camouflage pattern. 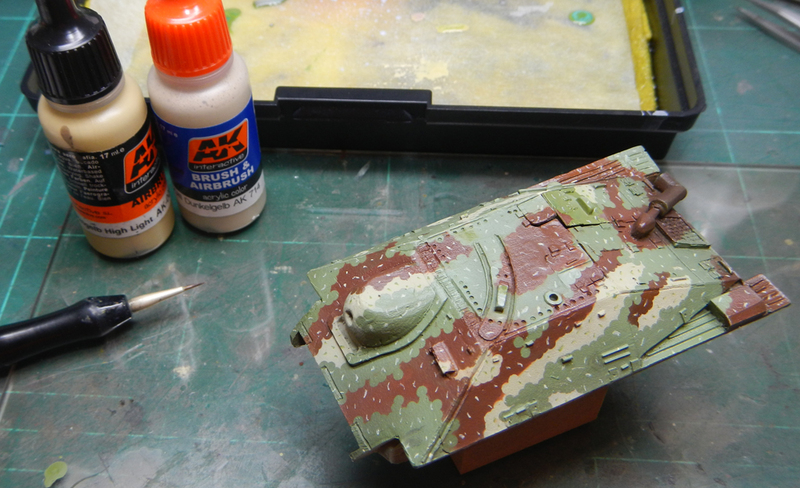 And I apply again the brown color using an airbrush. And I use a brush in small areas. 11. 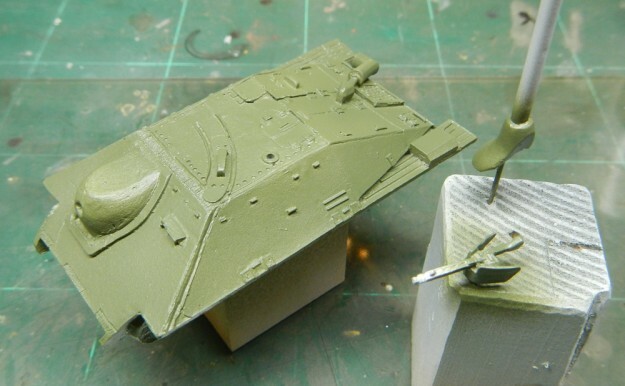 With green colors and Dunkelgelb, using a brush, I paint the areas that are not masked by discs. The circular shapes of this marks are the consequence of the application of circles on each others. Coming soon the second part!.